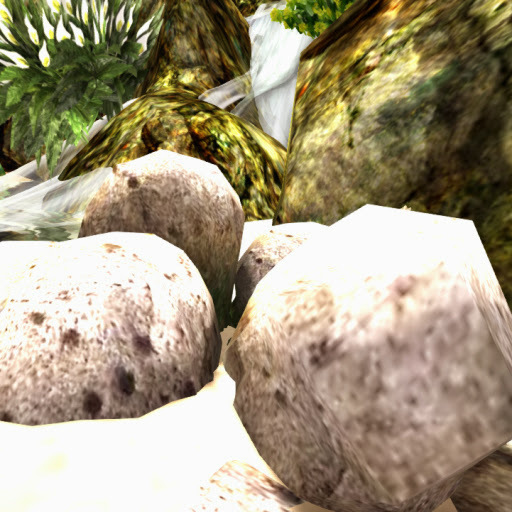 Rocks Fields LandscapingWaterfall add on deftly reconstructed in non-bubbling mesh showing medium-sized marble rocks in dirty white color with dark green moss at the bottom. 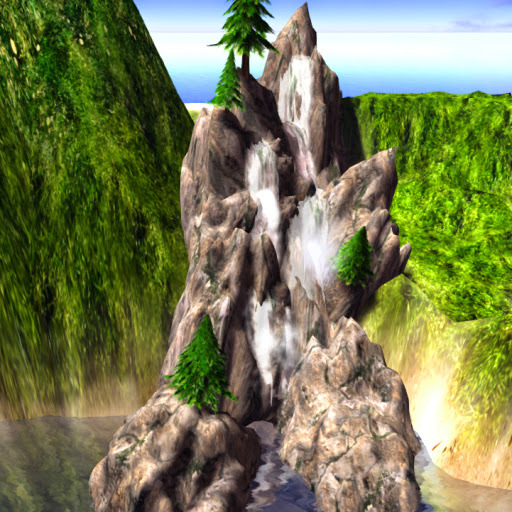 Comes with waterfalls sound in the background, an essential add on for landscapes with waterfalls. Add one now! only here at ACS. 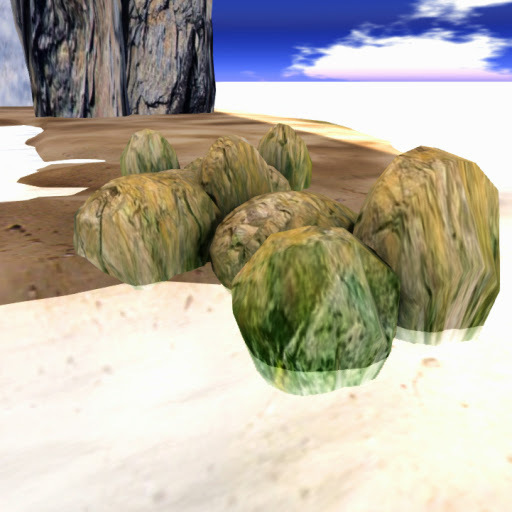 Rocks Fields LandscapingExcellent mesh in low prims! Smooth rounded marble rocks and stones integrated with real wildlife sounds for a more authentic landscape. 3D experience refined only by ACS. 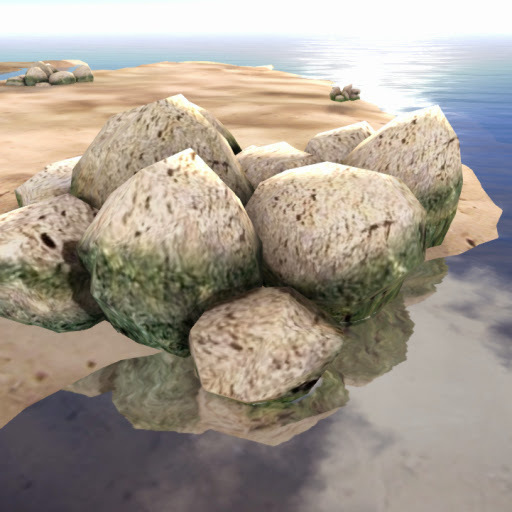 Rocks Fields LandscapingSculpt that is so realistic, you'll want more!Non-bubbling mesh of four large rounded dark brown rocks placed near each other. The rocks have layers at the side, showing geologic activity and signs of weathering. Stack it near a mountain or hill to provide a more natural touch. 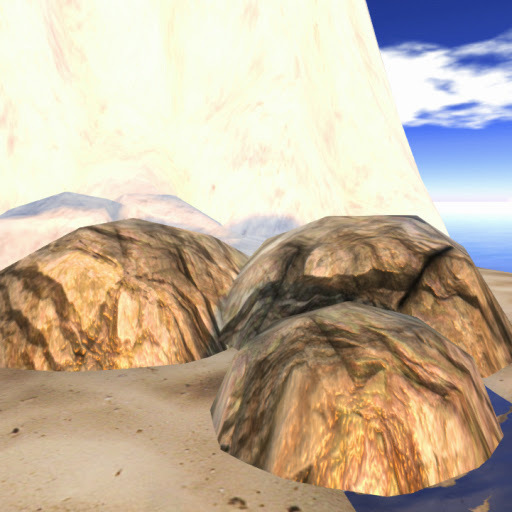 Rocks Fields LandscapingFurther supplement your winter scenes with the finest mesh sculpt in SL! Three elongated oblong rocks in a mix winter colors of black, white, blue and gray stacked together. excellent decor for seaside or near other bodies of water. 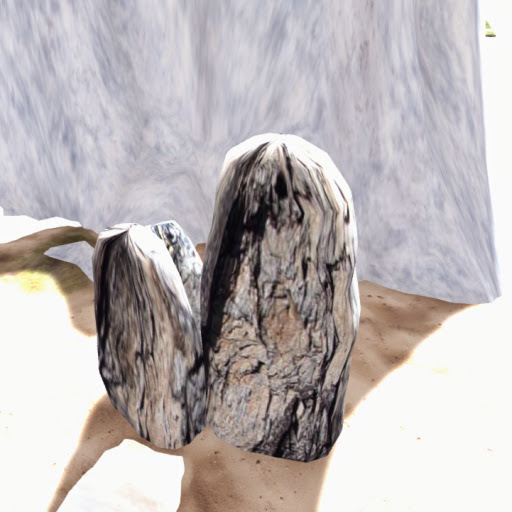 Rocks Fields LandscapingDesigned to provide the most realistic and natural landscape in a few prims, this rounded, dirty-white marble rocks with moss coverings near the bottom bundled together is exceptional decor for big gardens and mountainous terrains. 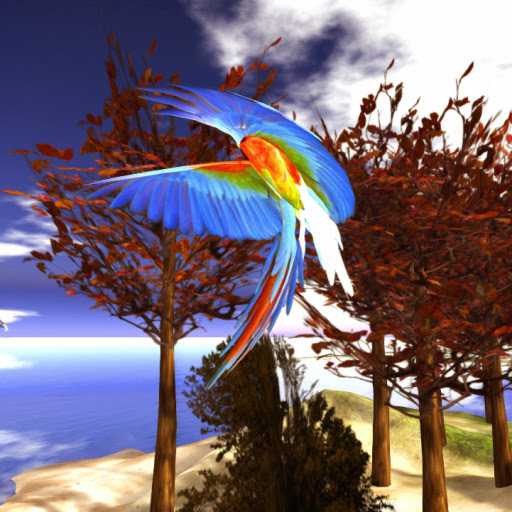 AnimalPlay as Pirate or just enjoy basking in the summer sun at the beach, with this colorful bird flying around. Featuring a Single Macaw Parrot in light blue, bright red and yellow plumage typical of the species. The bird flaps its wings when touched. AnimalBewildering item rendered in low prim mesh of astounding sculpt! Albatross in typical black and white plumage and yellow curving beak gliding in the sky. 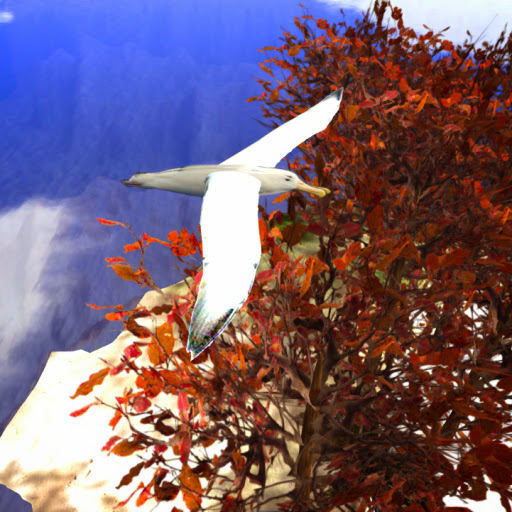 The bird is a typical flier in the beach sky, therefore an important item to complete your beach scene. AnimalBeaches without any forms of wildlife can be dull and boring. Flying sea gulls or other beach birds loitering around is a prime symbol of a beach unspoiled by man. 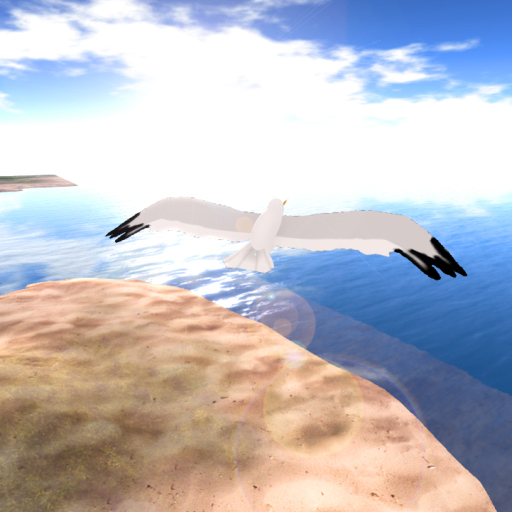 Place ACS Seagull in your beach high above your skies and watch this white feathered bird flaps its wings and do wonders in your beach. 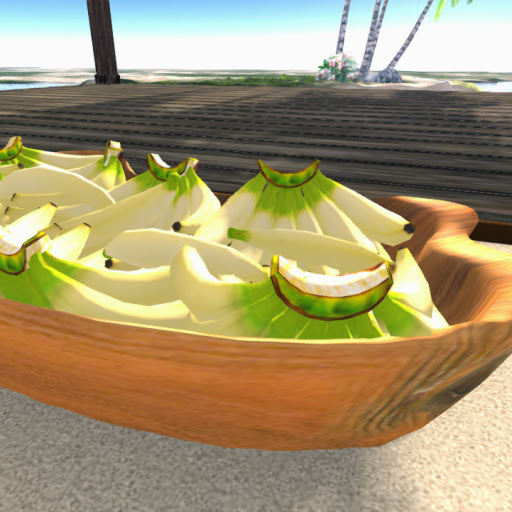 Decor Decoration DecorationsTropical island scenes may benefit from this detailed mesh sculpt in three dimension without the intrusion of bubbling, rendered expertly for our beloved clients.Here is a large curved wooden tray filled with several bunches of Lacatan Bananas in yellow green colors. 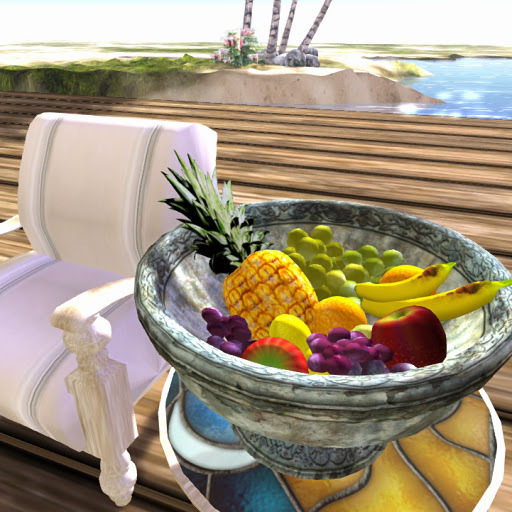 Decor Decoration DecorationsHome decors that will bring fruity tropical feel! Grey-colored ancient-style fruit bowl carved out of a rock etched with intricate patterns. A pineapple, two bananas, oranges, lemons, lychees and grapes of two varieties adorned the bowl. Decor Decoration DecorationsStriving for a well decorated home? Here's a item that will help you! 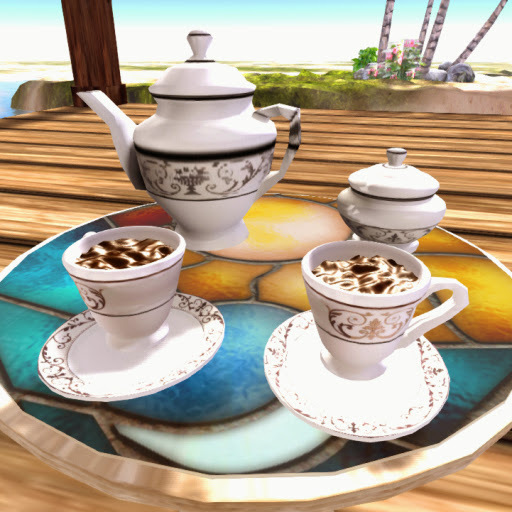 Sculpt of white porcelain tea cups, tea pot and jar with intricate Oriental-inspired designs. The two cups is filled with black coffee ready for serving. Exclusive item available FREE OF CHARGE to all residents of Anshe Chung Sims and partner estates. Save thousands of Linden$! 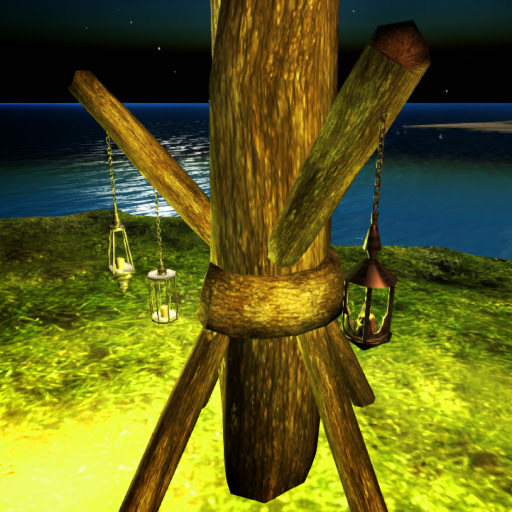 Decor Decoration DecorationsLight up your gardens with these amazing item! Five small oriental-inspired lamps with black base attached on a long cream-white twisted ropes. 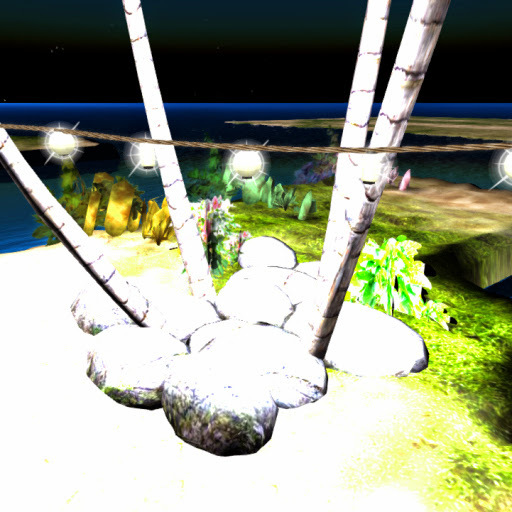 The lights can be turned on of off by touching the lamps and accessing the menu. Decor Decoration DecorationsDetailed mesh sculpts in three dimensions without the intrusion of bubbling, rendered expertly for our beloved clients! Featuring wooden plate with several intricately designed forks stuck on the fruits. 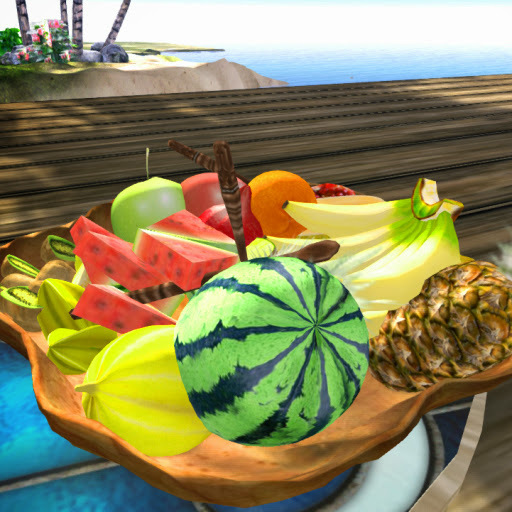 The fruits in the plate is composed of a pineapple, watermelons both whole and quartered, a dragonfruit, several halved melons, a bunch of kiwi both whole and halved, one bunch of Lacatan Bananas and a few starfruit. Decor Decoration DecorationsAuthentic winter looks is sometimes hard to achieve. Try to rezz this item and see its amazingly detailed mesh! Featuring a large piece of log pierced on several sides to form a tripod to support the tree stump. On the free hanging parts of the tripod three candle lamps are hanging to provide light. Designed to provide the most realistic and natural landscape in a few prims to bring life, diversity and beauty to your lands. 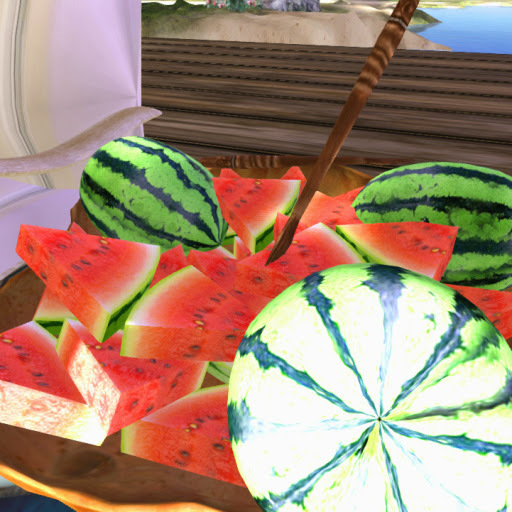 Decor Decoration DecorationsAuthentically recreated Watermelons sculpted in low prim mesh with models of a wooden plate and several diced pieces of the fruit settling at the middle of the plate. Two wooden forks can be seen fixed on the diced fruits, further adding life for this wonderful center table decoration. Rock RocksScenic rocks for our ACS clients for free! 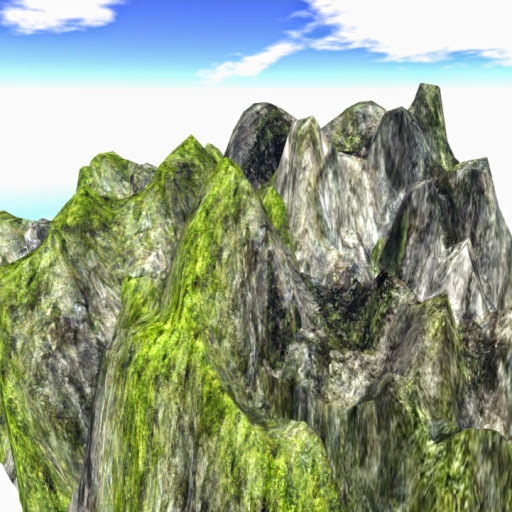 Finely detailed large mountain with sharp plunging peaks hugged by several green grass and moss. Sea waves gently laps at its foot. Exclusive item available FREE OF CHARGE to all residents of Anshe Chung Sims and partner estates. Save thousands of Linden$! Rock RocksCreate a scenic background that will surely make your guests look at awe to this uber imposing item! Featuring an extraordinarily real mesh of large grey rock mountain with extremely sharp peaks. 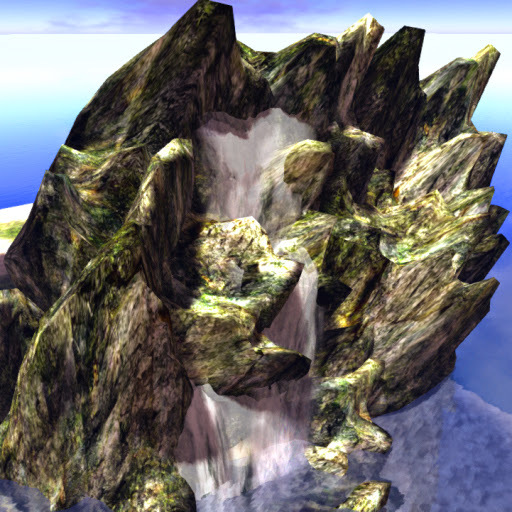 At the top of one of the peaks is a waterfalls creating a sharp and plunging water rapids. Exclusive item available FREE OF CHARGE to all our beloved residents of Anshe Chung Sims and partner estates. 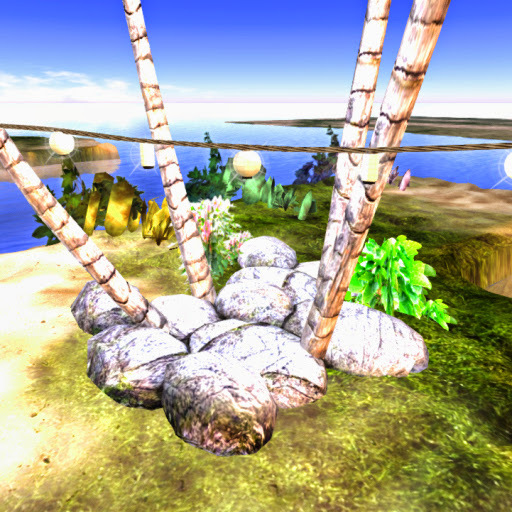 Decor DecorationDesigned to provide the most realistic and natural landscape in a few prims to bring life, diversity and beauty to your estate! Sample our small wooden hanging footbridge in dark brown color, supported by ropes and four thin poles. At the foot of one of the poles are several small ornamental plants. 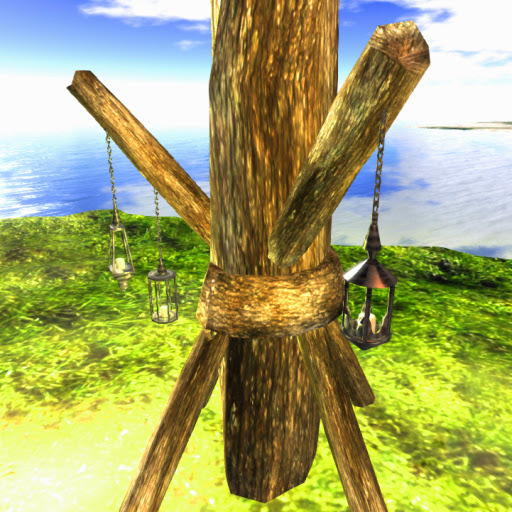 Decor DecorationOff sim item several notch higher than any item in SL! 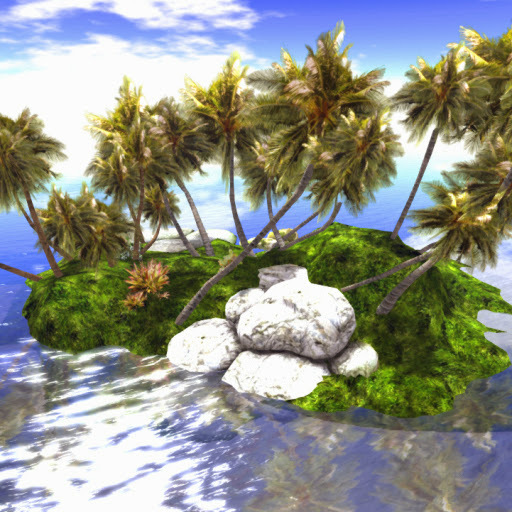 Crisp detail and an uncanny likeness to its real counterpart, this Island sim is composed of a grove of coconuts in yellow-green and brownish palm leaves and a grassy ground cover, with several small ornamental plants, with small cream-white marble rocks and larger flat-topped grey sandstone rocks placed at the shore.